Suresh Rao’s research focuses on innovative technologies for remediation of contaminated soils, sediments and aquifers. Specifically, he has developed and field tested new techniques for enhanced cleanup of soils and groundwater at hazardous waste sites. Locating these source contaminants and predicting their contribution to the groundwater pollution is difficult because the disposal history at many sites is usually unknown and the site hydrogeology is complex. Also, many variables contribute to how these chemicals react in the soil. By establishing an interdisciplinary hydrologic sciences graduate program at UF, Rao has been able to maximize the university’s resources to address this problem. The program has received nearly $4 million in grants during the past four years, and he has worked with several other UF professors to complete major field studies at sites throughout the United States. This “academic cluster” also has been successful in attracting top graduate students to UF, including two Ph.D. students who won the Soil Science Society of America’s annual award for best dissertation research. 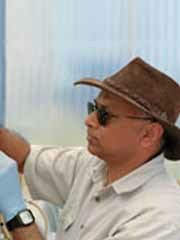 Rao has served as an editor or associate editor of several major international journals and has received major awards in soil science in recognition of his research. He has traveled extensively in Europe, Australia and Asia. Rao has been active in promoting the role of science in developing rational environmental policy. He served a three-year term as a member of the Water Science and Technology Board of the National Research Council. Rao has served on three prestigious National Research Council committees addressing groundwater contamination that have resulted in three important National Academy of Sciences reports on the subject. “In arenas ranging from pesticide behavior in soils to the uncertainty involved in risk assessment, to remediation of contaminated water, soil and aquifers, Dr. Rao has played a major role in putting the University of Florida on the map,” says R. B. Brown, chair of the UF Department of Soil and Water Science.